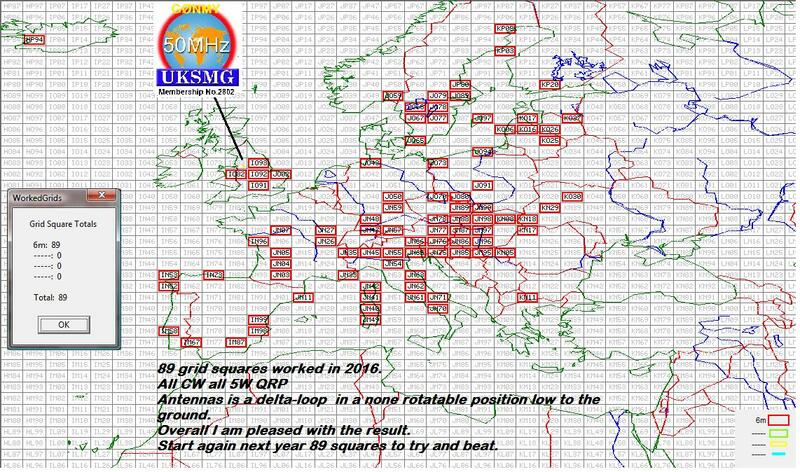 I Made 16 QSO's with a score of 442. HF conditions were quite reasonable for a change, and you would expect my score to be a lot higher. Well I was running 5Watts QRP from my Ten-Tec Argosy II. 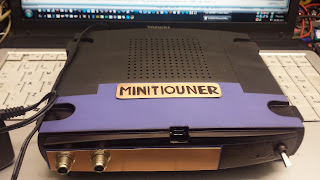 Into a mini G5RV antenna. Of course the Straight key had to be used as I don't own a Cootie Key or a BUG. I can tell you Glass arm hurts! from a source of flashing LED Lights in a shop window that run from 7am to Midnight 7 days a week. 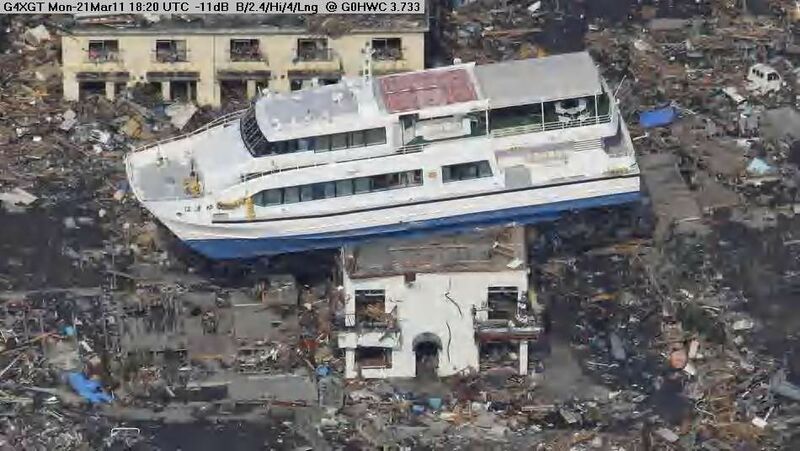 Here is a recording of it on 40mtrs which is the worst band affected. 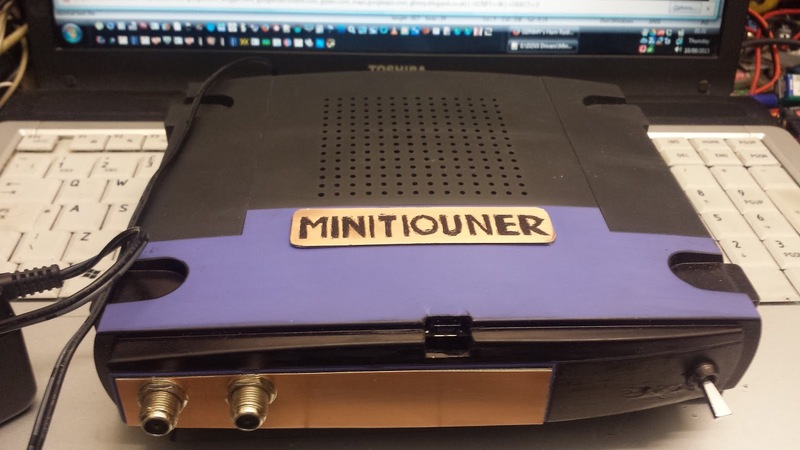 The MiniTiouner Program written by F6DZP Jean Pierre. 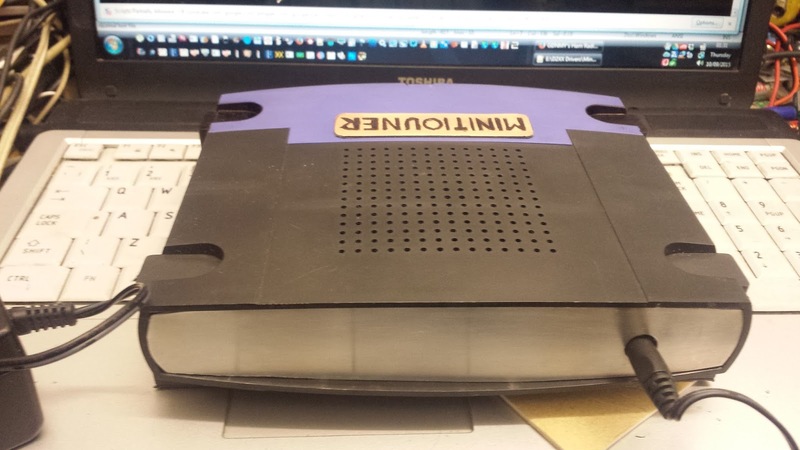 Here is a picture of the built unit tested and ready to be boxed. 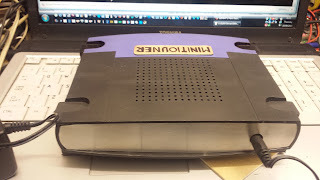 And Here is the Unit Boxed inside an old linksys router case. 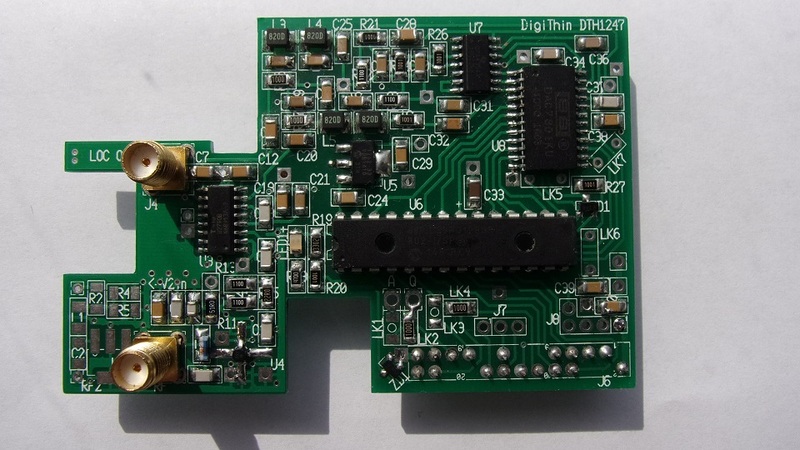 The next part of the built project is the Digi-Thin Transmitter. This is an add on board that plugs onto a Raspberry PI with a PI web cam creating a stream to transmit on the Ham Bands. Note this system is purely for a low symbol rates and is for experimentation running on 4mtrs 6Mtrs 2Mtrs 70cMs and up. 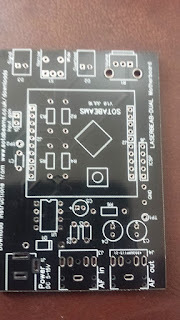 This build is mainly surface mount components and is not aimed as a beginners build me kit. 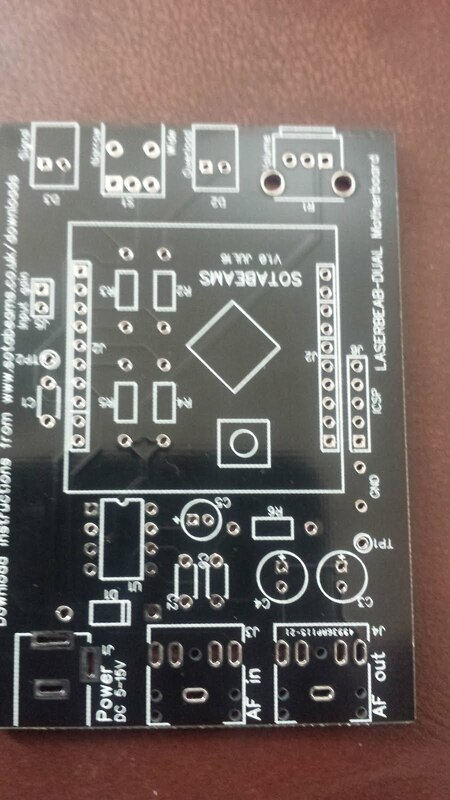 Again a PCB and hard to get components are available on the BATC web site. 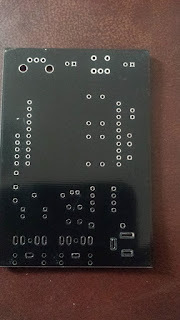 Here is an image of the Digi-Thin board that fits onto the Raspberry PI mini computer. 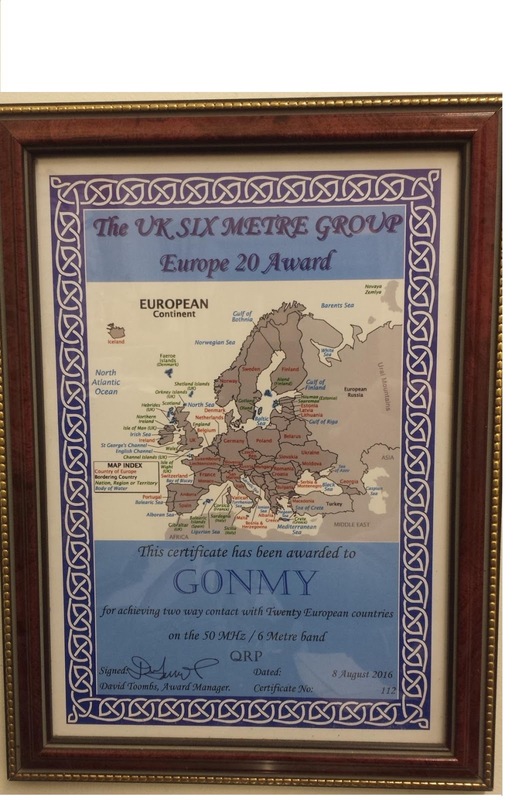 So More fun to be had on the Amateur radio bands. I love this hobby! 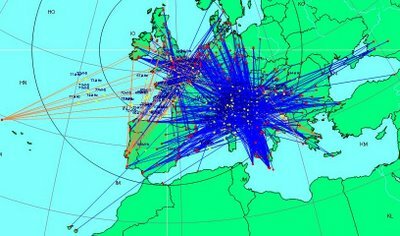 Today I have been trying out MS (Meteor Scatter) on 6m. Meteor Scatter propagation is when tiny dust particles enter into the earths atmosphere at a very high speed and burn up. This produces very short durations of Ionisation in the E layer and can therefore act as a reflective medium for VHF Radio waves. 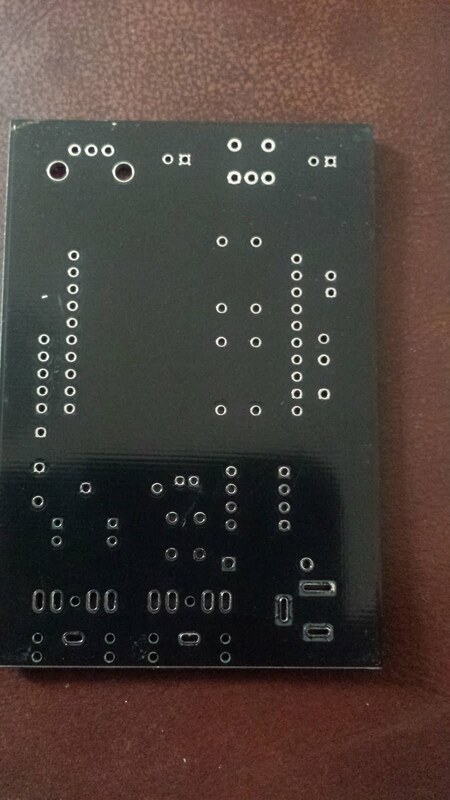 Years ago the method used was very fast morse code signals that were transmitted over and over for 1min or more! A cassette tape recorder's speed was modified to run very fast and record the bursts of fast Morse code being transmitted. The tape would then be rewound and played back at a much slower speed so the morse could be decoded by the Radio Ham. 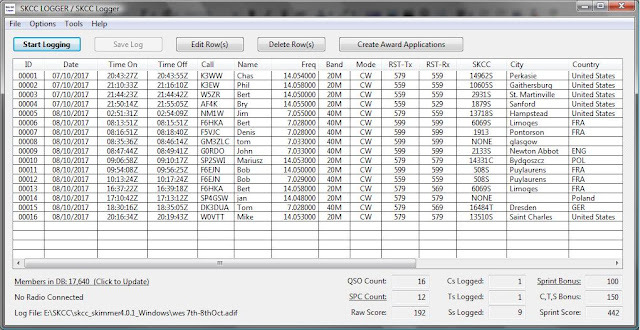 Today however we use a program called WSJT Version 10. which uses multiple tones to represent letters and numbers and transmitted repeatedly for 1min or 30 seconds duration. The software uses a computer soundcard and a transmit and receive interface to send and receive the tones and to decode them in real time. 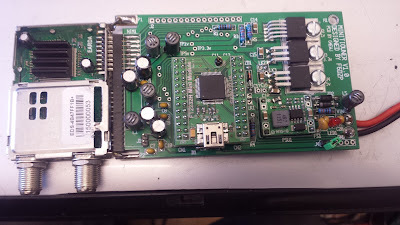 Anyway having set up the program I connected my interface to my Yaesu FT290R running 2.5Watts, which then drives my R & L Electronics transverter converting the 144MHz signal to a 50MHz signal. The Transverter is quite low power and only runs 25Watts, so I have not done too much transmitting yet. 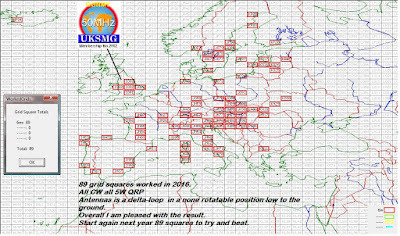 However today while I was monitoring 50.230 I copied a really good MS Burst from HB9Q who is located in Switzerland. He came through quite strong and considering I only have a lowdown Delta loop which is just a single loop of wire cut for 50MHz band, I was pleased to copy his Meteor Scattered signal. 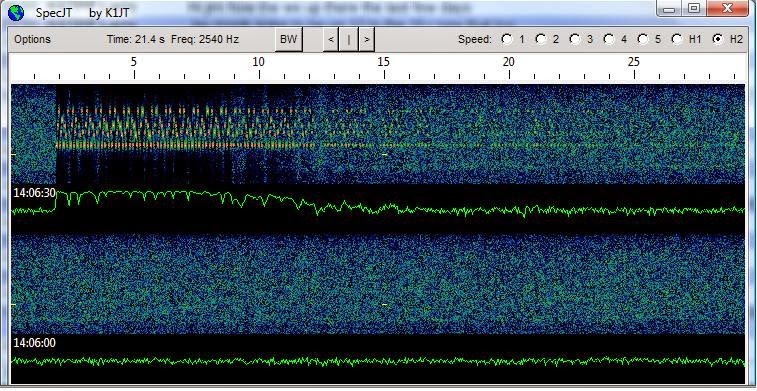 Here is a picture from the WSJT program showing the captured signal. 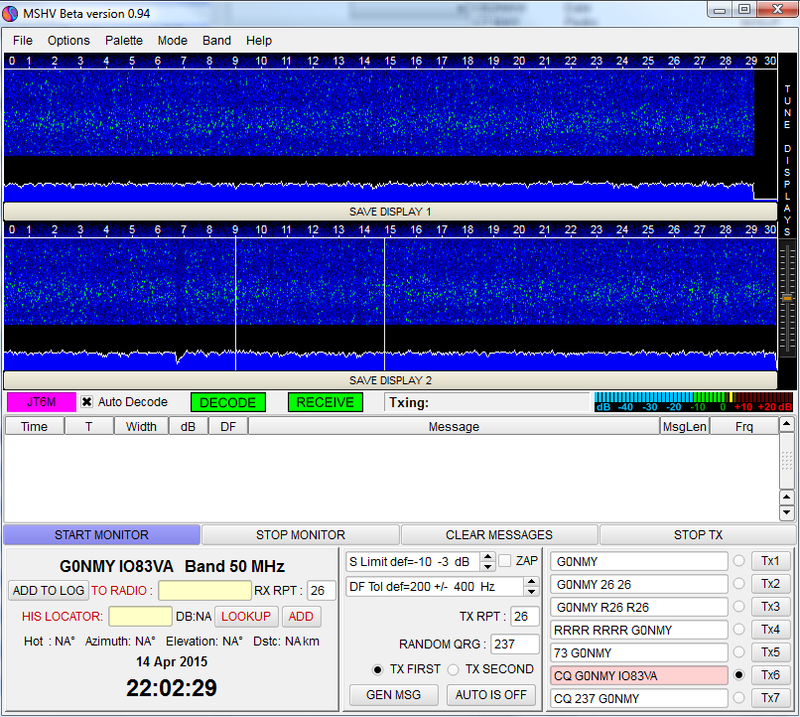 You can see the Data stream in the top of the two signal traces. 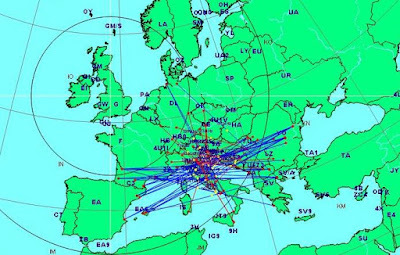 While Switzerland isnt that far away I was still pleased to receive my first decodable MS Burst on 6m using JT6M Meteor Scatter mode. 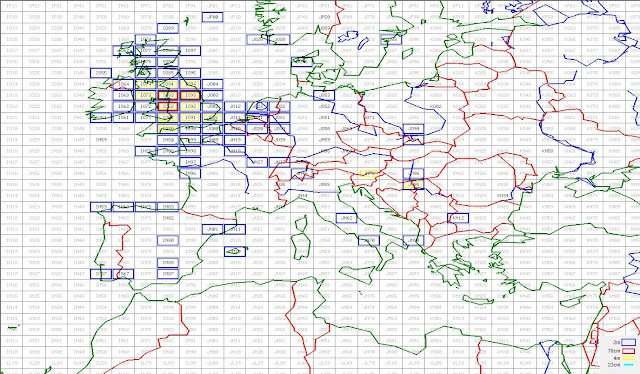 So there you have it more radio fun to be had, although I do think I need a bigger antenna and a bit more transmit power for others to copy my signal, but you never know on 6Metre band surprise is the norm for the band nicknamed The Magic Band! 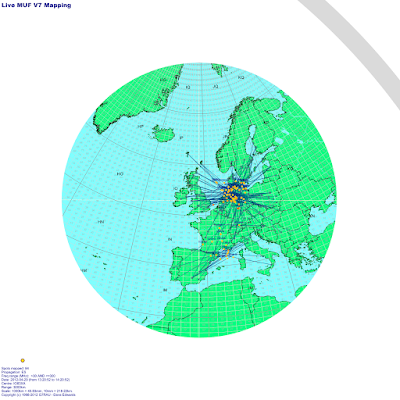 which gives E-W radiation pattern. 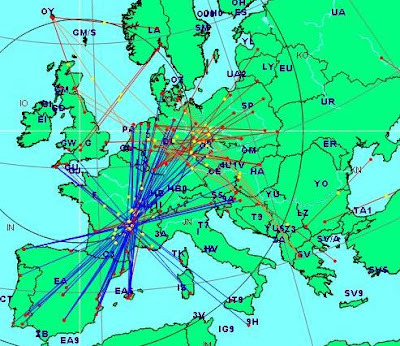 Well Today there was a Sporadic-E opening towards europe and whilst I didnt contact many stations with my limited setup I did work all new DXCC's and Locator Squares, The reason? I have never been really active on the Magic Band so I am basically starting from scratch. So of course every contact is a new one for me, which adds to the real fun of 6mtrs. 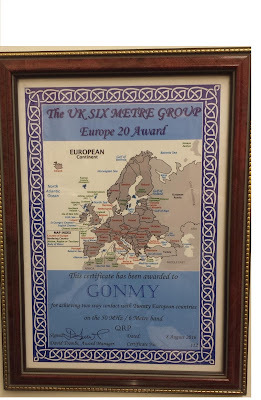 So today I got 4 contacts and 4 new DXCC countries so that is great! 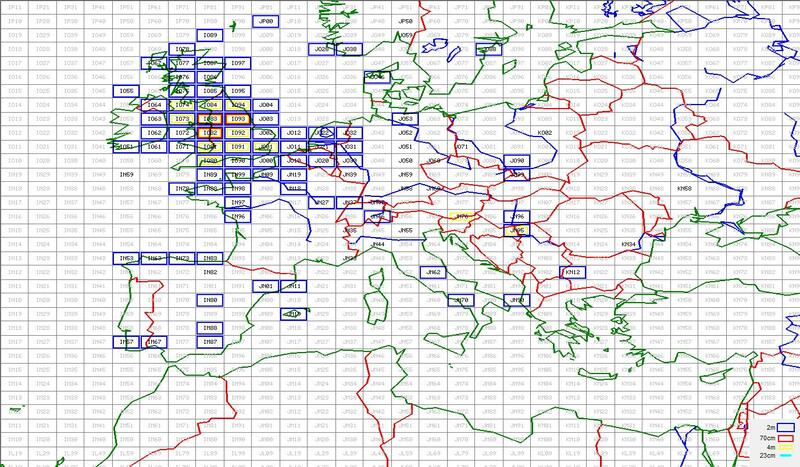 Below is a graphical representation of the areas who managed to contact each other. Below is a small video recorded on my phones camera so the quality is quite poor but you will see just how strong a signal certain stations were. So as you can see nothing exotic nothing rare, but all new to me on this band so I am pleased as punch. 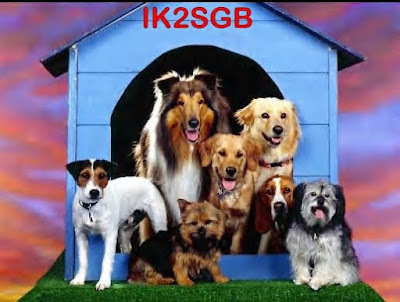 pictures on the 20mtr band 14.233MHz. digitally, what segments were missed from the image. parts until you have the full picture. for my blog page. so watch this space. am testing to see if they upload ok. So thanks for reading and blog ya soon. 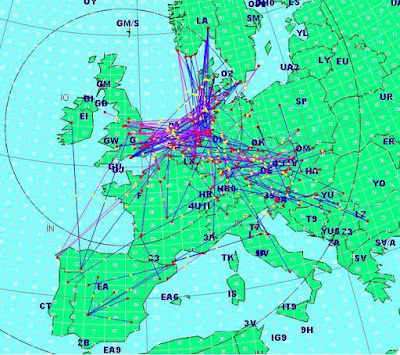 Well I havent been very active for a long time now and when I have it has mainly been listening to the HF bands. portable on top of mountains. 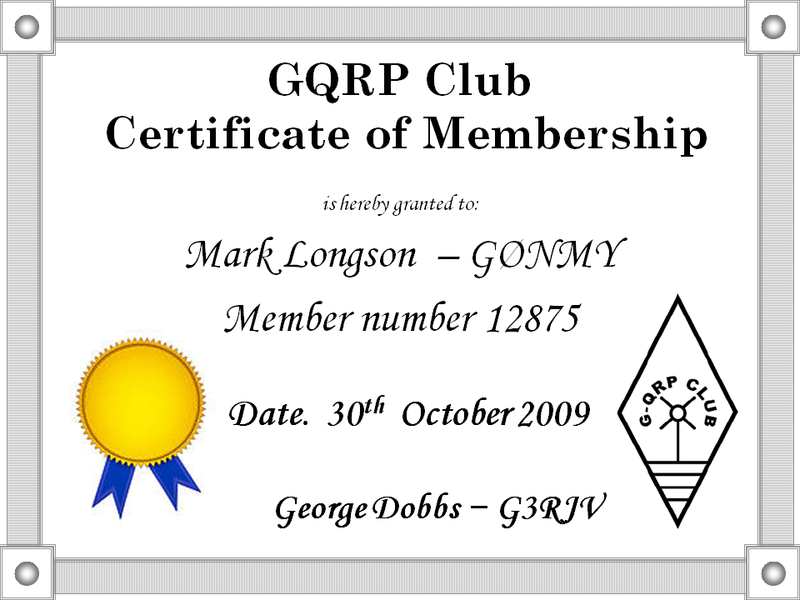 One such Ham is Steve NØTU who along with his two loyal goats named Peanut & Rooster, they help to carry his equipment to the summit he manages to work some good dx using only 5w and CW using Morsecode. Check out Steve's Blog. 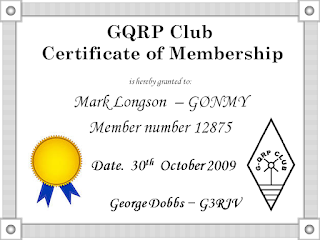 This got me interested in cw again and I decided after listening to morse on 20mtrs I was extreemly lacking in my ability to decode the code at a decent speed. So I am now practicing to try and build my brain up again. There are a few ways to do this however, I chose two options. The first is on the Internet using the website called Learn CW Online, which is an excellent site to help the complete novice to the most ardent brass pounders and paddle strokers around. The 2nd option I went for was to download the program called MorseRunner. 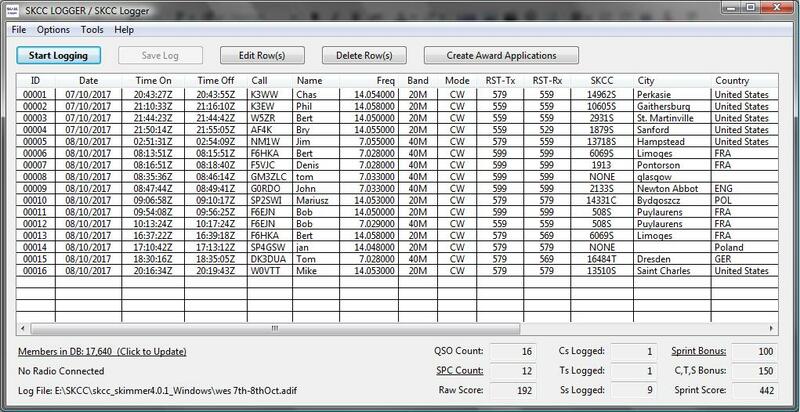 This program simulates a cw contest and prepares you for such an event. not that I think I am ready to enter such a contest I just cannot decode well enough yet. Anyway thanks to Steve and his goats I have re-aroused my morse interest and will be practicing regularly to get back to my old capabilities.